At the end of a day's ride it can be dispiriting to turn up at a campground and find it closed. When you ride on and half an hour later a second campground is closed, then a third, you can begin to wonder if there is a devilish plot. 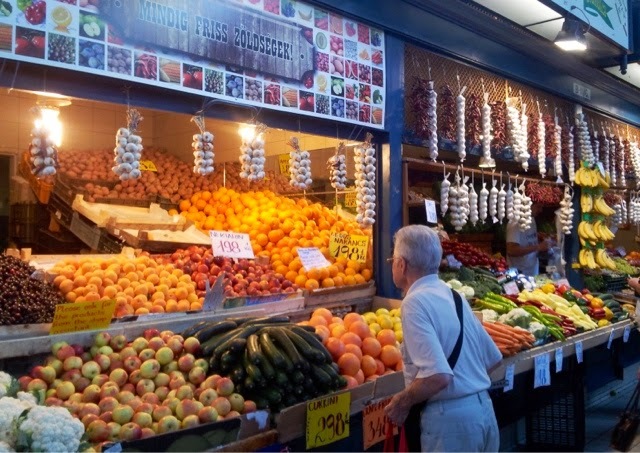 To make matters worse, we had bought groceries for dinner and the front panniers were loaded with strawberries and apricots, milk, a bottle of wine and other essentials - making the tandem heavy and awkward to handle. 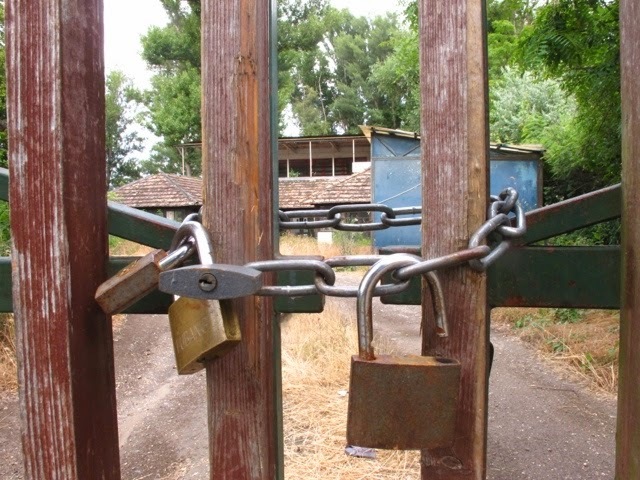 Each time we stopped to rattle a forlorn gate, mosquitoes descended on us. 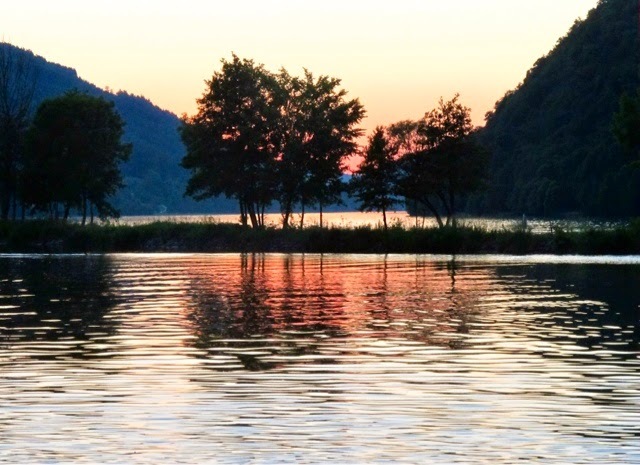 Another campground closed on what is recognised as one of the most delightful sections of the river - the Danube Bend, near Budapest. As we cycled on, we began to realise what had happened. We were seeing the effects of flooding that occurred on the Hungarian part of the Danube in August last year. We spotted 'For Sale' signs - sometimes on every third house, and we could see where the water had surged up and into gardens, turning once pretty lawns into grassless wasteland. 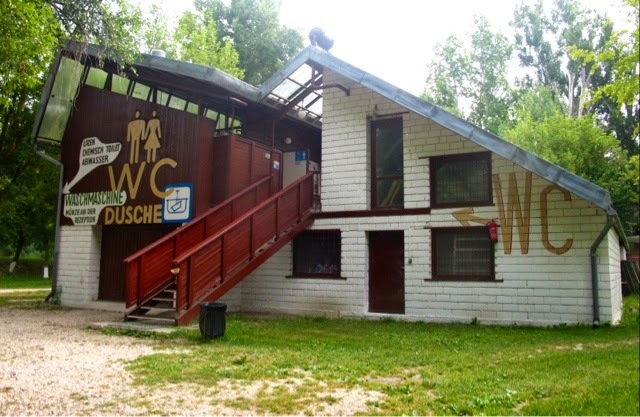 Storage downstairs, facilities upstairs as a way to beat the floods at this campground. 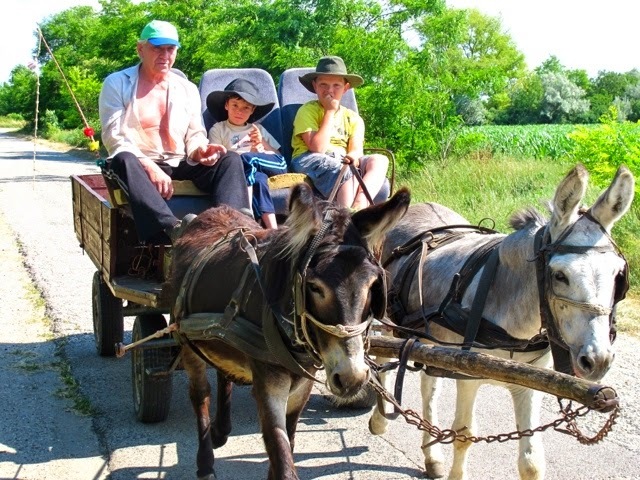 At our fourth campground, at the town of Szentendre about 20 km from Budapest, we were in luck. 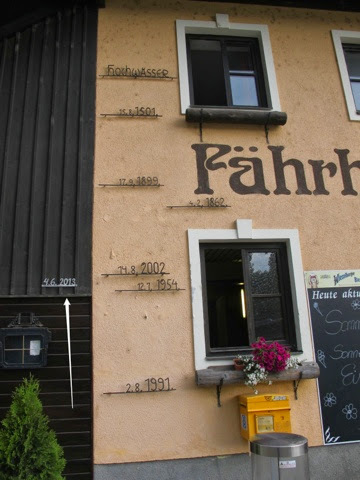 Showing some forethought, the owners had constructed most of the facilities, kitchen, showers and so on, on foundations that stood well above any likely flood. As a result, they were still in business. 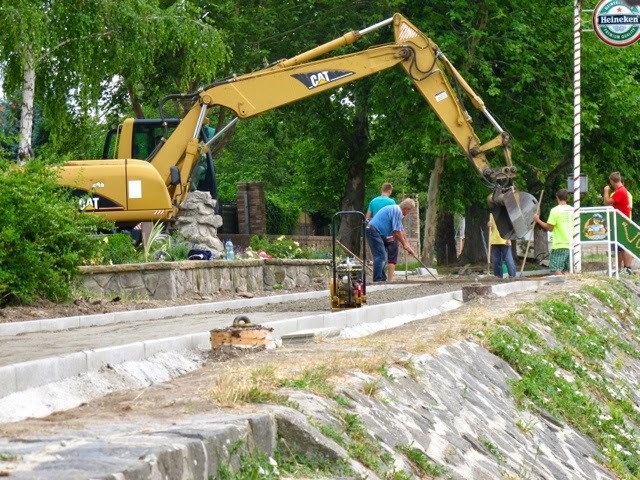 Paths and bike trails are underway in Eastern Europe as a way of encouraging more tourists to the area. The flooding was a reminder to us of just how the Danube effects the lives of people along it. It provides hydro-electricity, allows the shipment of freight, provides tourist dollars from cruise boats, and yes - when it floods, it dumps vast amounts of silt which enable the growing of crops. 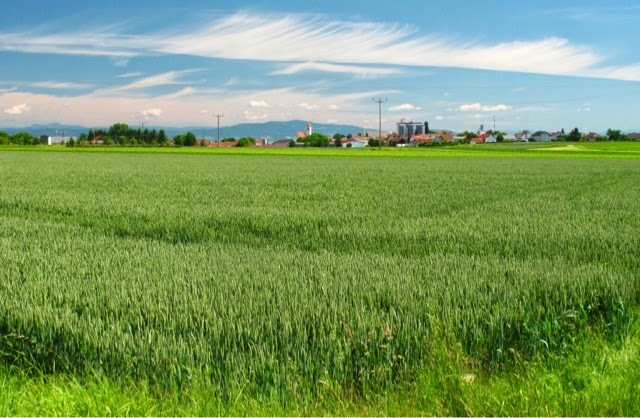 It also provides an excellent breeding ground for mosquitoes - don't forget the repellant. Arrival in Budapest. Across the river on the Pest side is the parliament building. 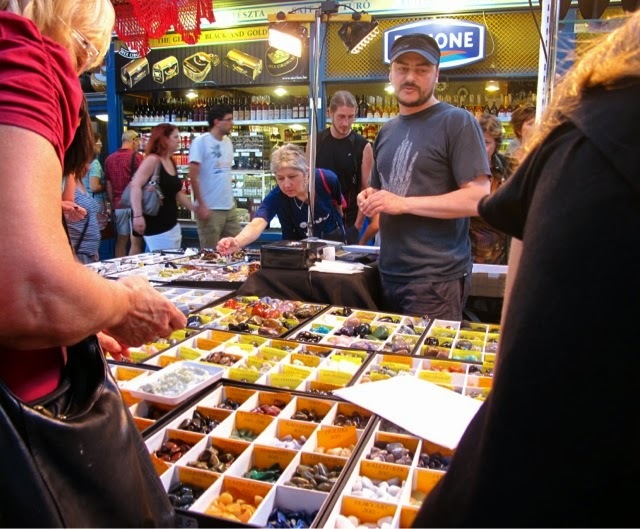 Seller of semi-precious stones, Central Market. 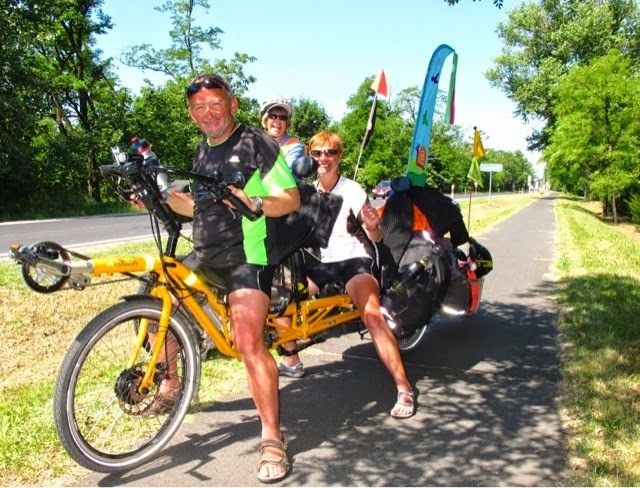 We met this French couple, Gino and Pascale, on their way to Budapest. They were riding what looked like the Rolls Royce of tandem recumbents, or should that be recumbent tandems. Made in the Netherlands, it was fitted with an electric motor to ease the way up hills. A trailer is towed behind. We share a drink in Budapest with Gill and Ross, a couple from Adelaide. The further east we go, the rougher we expect the roads to get. Um.... Where exactly is the road? 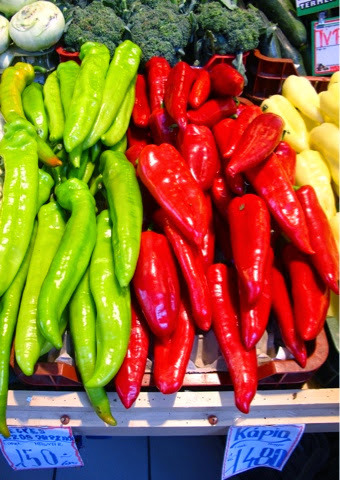 Taken in the main square of Gyor, Hungary. Lunch stop just inside the Hungarian border. No wine, but the mozzie repellant (yellow bottle) is at the ready. 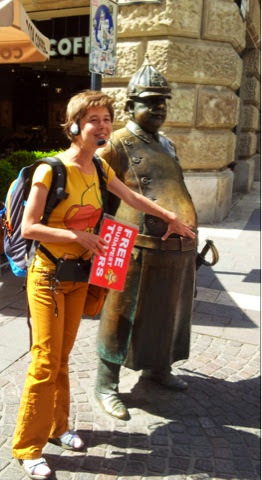 Bratislava has a youthfulness and energy about it we felt the moment we arrived. 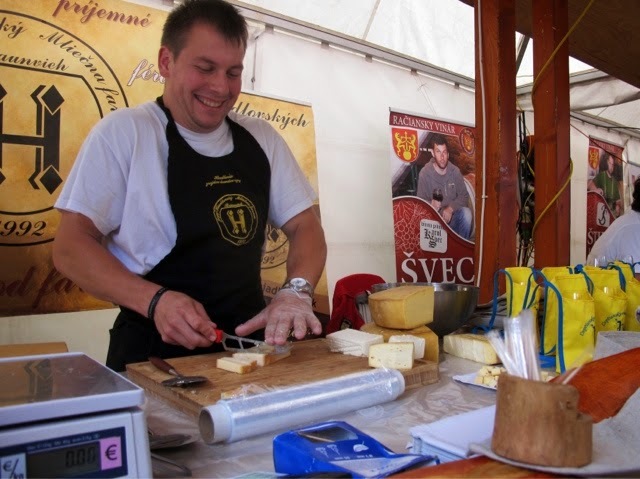 Perhaps it has something to do with the country's recent past, and the need to move on from the days when it was part of both the Eastern Bloc and the old Czechoslovakia. Then came the collapse of the Berlin Wall, democracy in the early 90s, a "velvet divorce" from the Czech Republic and membership of the EU. It's an awful lot to happen in 25 years. The city is easy to ride into with good cycle paths and tolerant motorists. 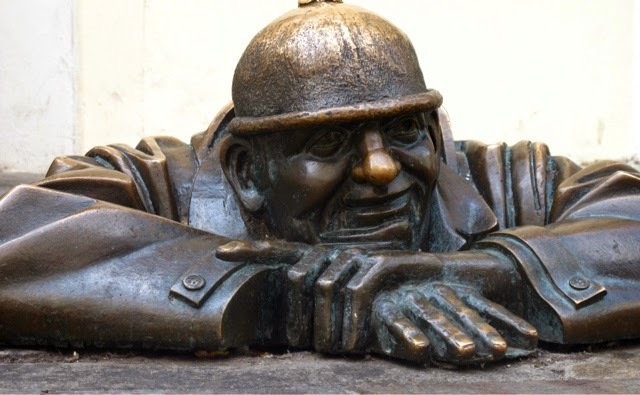 We gave Bratislava a couple of nights - staying at the centrally located Patio Hostel which enabled us to walk everywhere and leave the tandem safely locked in the hostel's luggage room. 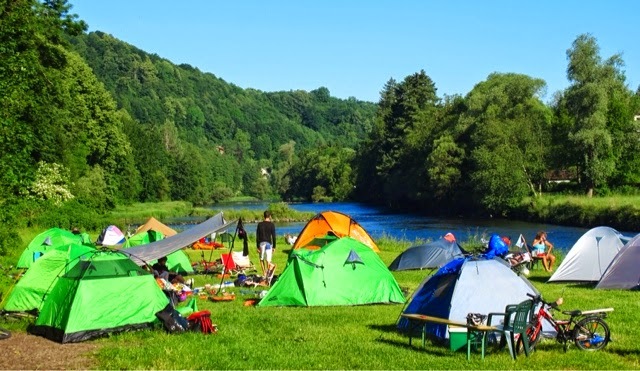 The nearest campsite is 9 km from the centre. 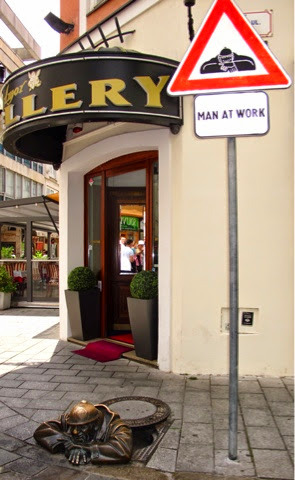 Man at Work - said to be the most photographed subject in Bratislava. It is suggested he reflects life under communism, with his head resting on his hands when he should be working. "People didn't work hard and they weren't paid much," someone said. After a motorist knocked the workman's head off, a street sign was put up to warn drivers. Built in 1972, this modernist bridge crosses the Danube. It boasts a viewing platform and an expensive restaurant. Its construction required the demolition of part of Bratislava's old town, something the Soviets probably didn't care about and the locals haven't forgotten. 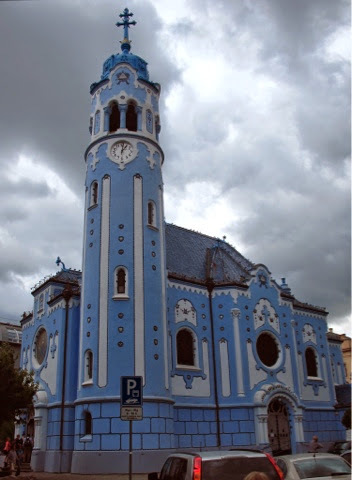 The Blue Church - early 20th century, art nouveau. 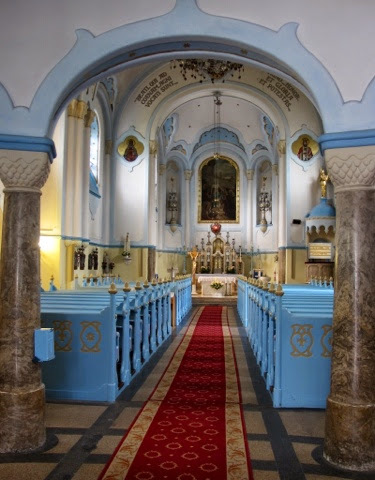 Was it a job lot on the paint or just a priest with a passion for blue? 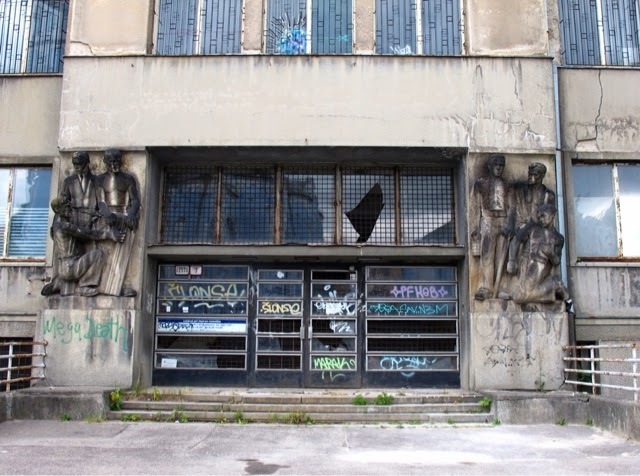 when the newly married couple emerge from the church they are confronted by this - a derelict, communist era hospital directly across the street. 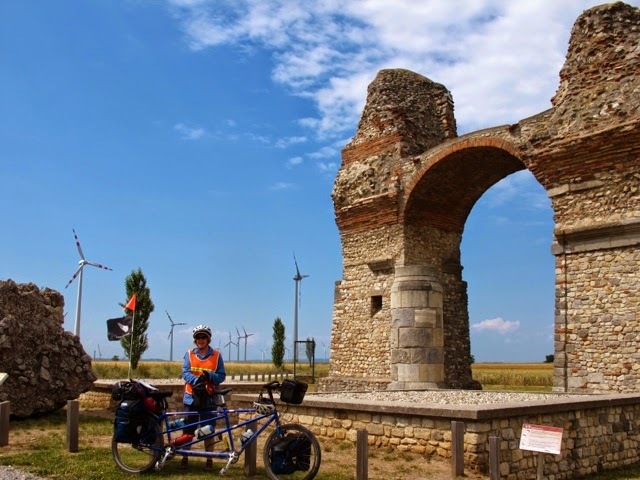 French cyclist Maud, like us, is following the Danube to the Black Sea. 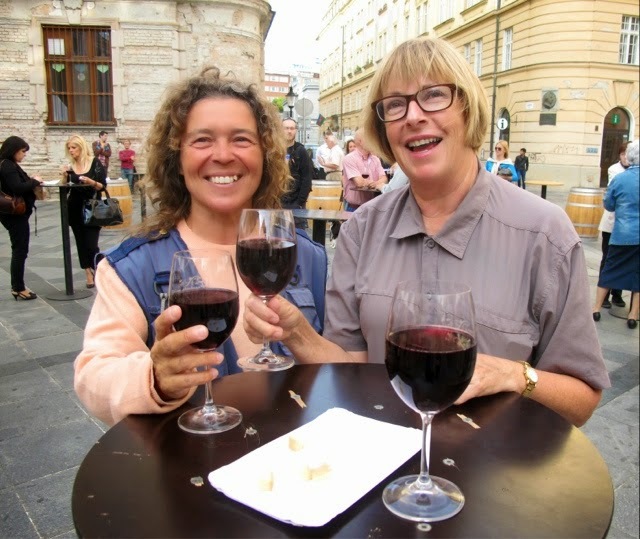 Here she and Judy enjoy a drink at a weekend-long wine festival in the old town. 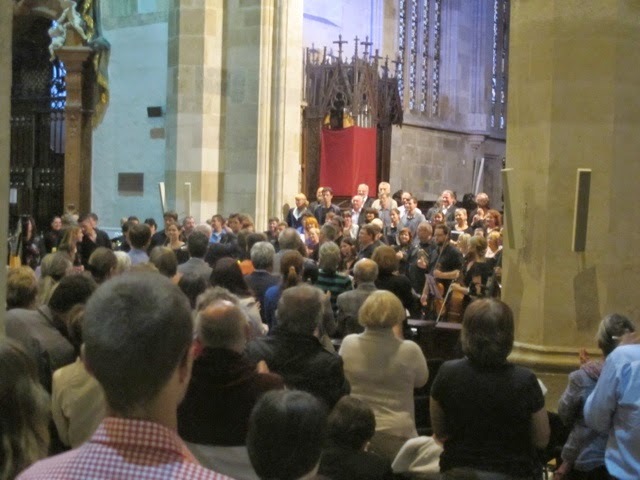 Applause as a free concert of classical music draws to a close in St Martin's Cathedral - the cathedral is where 11 Austro-Hungarian monarchs were crowned. 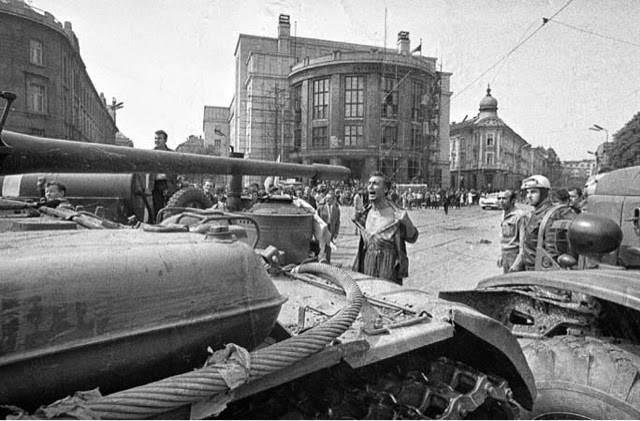 This famous photo of a man baring his chest to the might of Soviet invading tanks in 1968 is often said to have been taken in Prague. It wasn't. 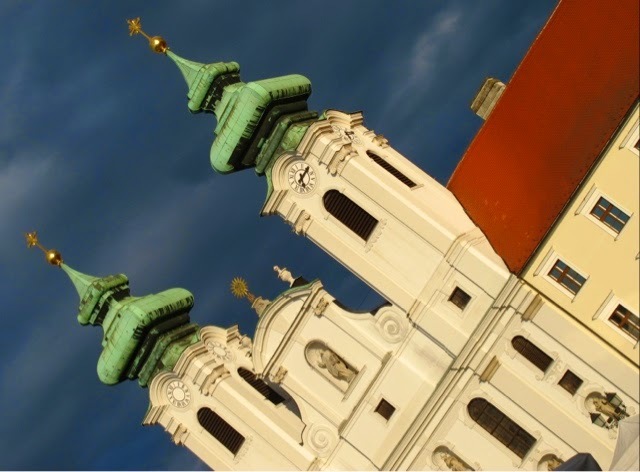 It was in Bratislava, in front of the university's law faculty which still stands today. 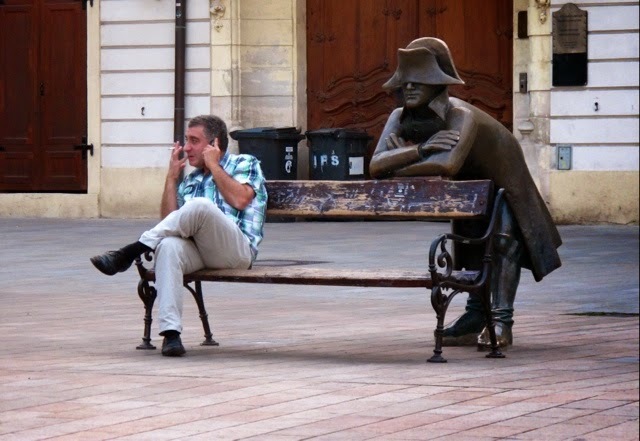 A Napoleonic soldier eavesdrops in Hlavne Nam Square. On our way from Vienna to Bratislava. We are riding on a cycle path on top of a dyke that helps contain the Danube. 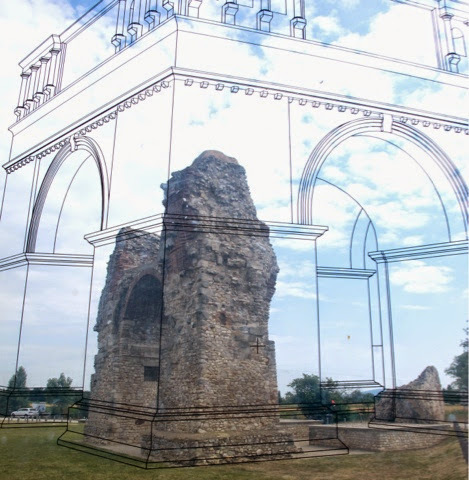 Roman ruins at Petronell-Carnuntum, Austria. This was one of the entrances to a victory monument erected for Caesar Constantine ll about 350BC. In the background, a wind farm quietly hums away. Time, weathering and possibly the ravages of man have worn away much of the original structure. 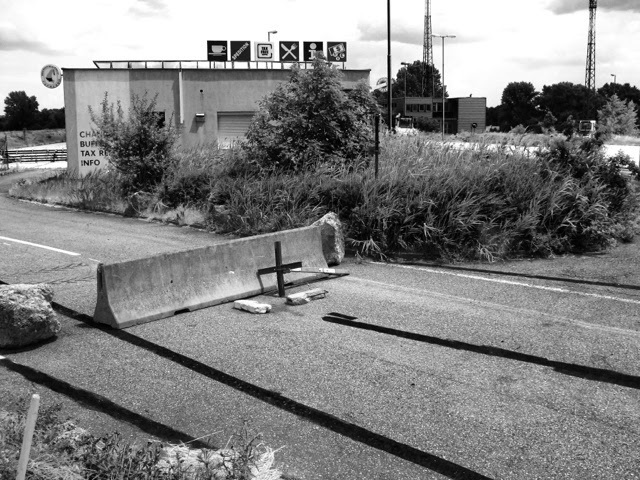 The disused border post between Austria and Slovakia. No officialdom but old signs promise tax refunds, money changing and a buffet. The last stretch into the capital of Slovakia. 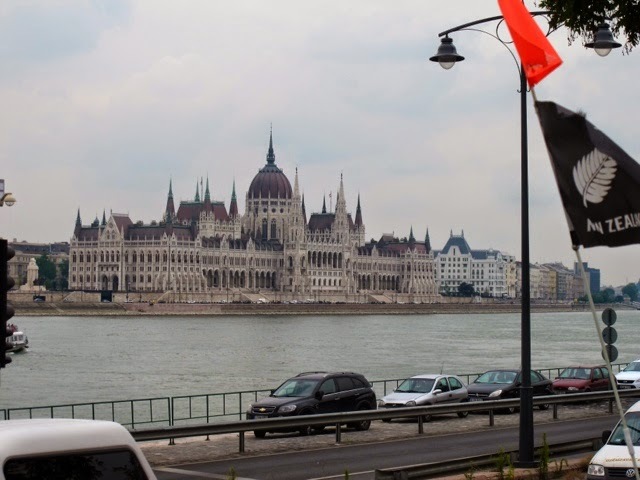 The building in the background is Bratislava Castle, once the seat of Hungarian royalty. Anyone who knows Judy the Stoker knows that a sense of drama, of suspense even, is never far away. We have been on the road less than a fortnight and I've been reminded of this on several occasions already. 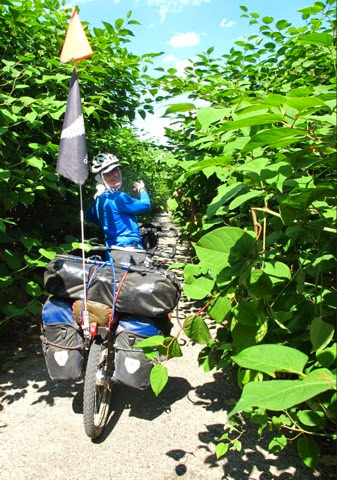 The latest came this morning when the Stoker announced from the back seat of the tandem that she needed a loo stop. No big deal, we are both used to ducking into the bushes when necessary. 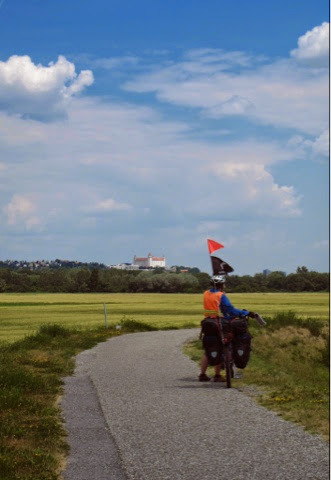 Unfortunately, we were approaching Vienna on a cycle way and it was Sunday. MAMILs (Middle Aged Men In Lycra) were out in force, and behind every likely bush couples were relaxing before the onslaught of another working week in Austria's old imperial capital. As the pressure mounted and the cries of anguish grew more dramatic from the back seat, we pedalled on looking for any opportunity. Perhaps in sympathy, I began to feel the need as well. Suddenly a banhof, a railway station, appeared and Judy made a rush for the platform. A moment later she re-emerged with a look of pain, of desperation, on her face. So it came about that the Stoker proved that women can use a men's urinal, by approaching it backwards and hoping that the bowl is not so high they can't stand over it. The relief. Wilhering Abbey, all to ourselves. Which brings me to the broader subject of how to cope with a call of nature when cycling. For both men and women, behind a bush has to be the simplest and quickest. If there's no bush, women are at a distinct disadvantage as us men can simply turn our backs on passersby. Judy did try something called a Shewee, but a test run in the shower at home proved unsatisfactory and she gave the device away to another female outdoor enthusiast. 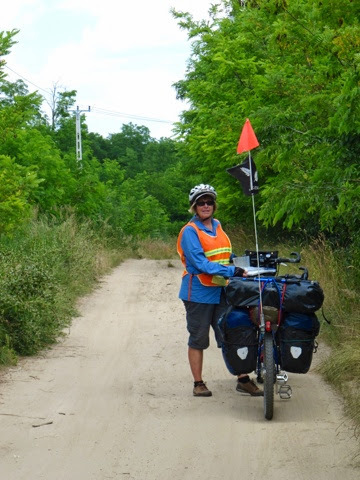 Another alternative was put forward by long distance cyclist Josie Dew, the author of several highly entertaining travel books. She used a cape to provide privacy while she squatted, well, just about anywhere. The only hazard was pee puddles and a damp cape. 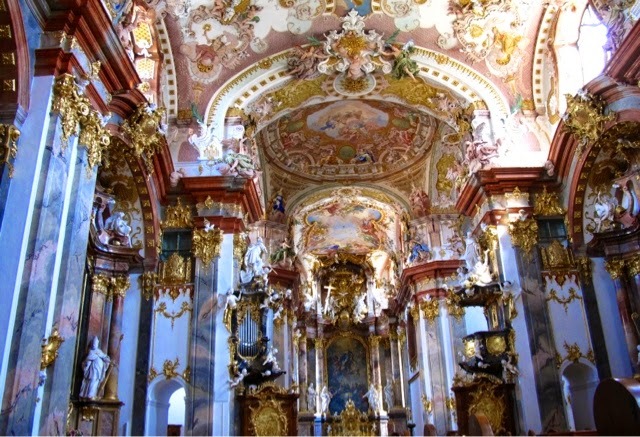 Religious bling on steroids - the interior of the Abbey at Wilhering. The style is rococo, the result totally over the top. Today's suspense is not the only drama of the past few days. We were enjoying our cycling ritual of morning coffee at an outdoor cafe when Judy exclaimed, "My wedding ring, I've left it behind." 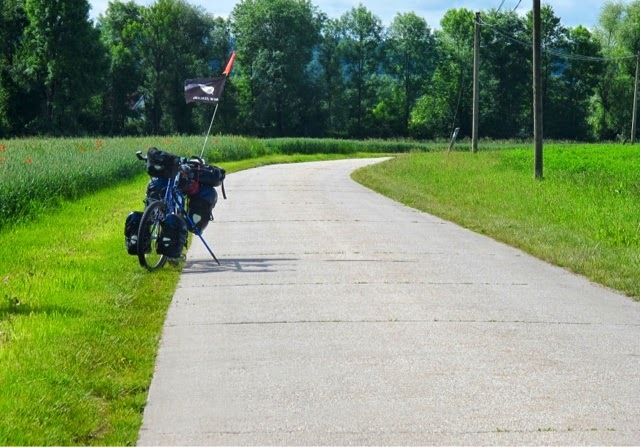 Behind in this case was 20 km away at the last campground at Grein, and if there is one thing cyclists hate doing it is retracing their tyre tracks. "I left it in the women's, or perhaps on that table by the tent. Or maybe, it's in that little pocket in our tent and I haven't left it behind at all." The logical action would have been to unpack the tent and check if the ring was there. Together though, we settled for the suspense of waiting all day until we unpacked at the next campsite. When we did, no ring. 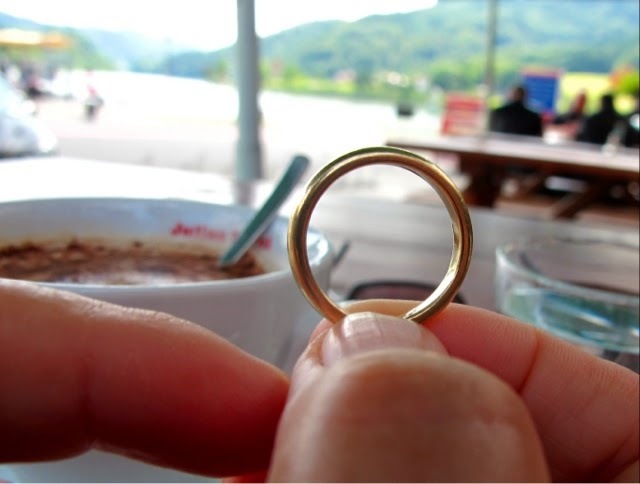 After a couple of phone calls, it was established the ring had been found - at the table - and the following day we spent one and a half day's budget using public transport to go back to Grein to collect it. Barman returns Judy's ring at our campground at Grein, Austria. Oh, and then there was me trying to inject my own bit of drama. Just as I deftly dodged a snake wriggling across our path there was a yelp from Judy. We screeched to a halt and she lurched from the bike clutching her neck. For a moment I had a vision of some kind of acrobatic snake, but it turned out she'd been stung, probably by a wasp. Pollin like snow, floats around us as we cycle. "You're going to have to monitor me for anaphylactic shock", she instructed, and then reminded me she had been allergic to stings when she was a child. We carried on, and for a little while Judy was unusually quiet. Mauthausen, where a WW2 concentration camp housed 200,000 people. About 123,000 died during the camp's seven years. We had passed Linz and Mauthausen, Danube towns which long ago moved on from their terrible associations with Adolf Hitler. But poor old Goebbels has no balls at all." 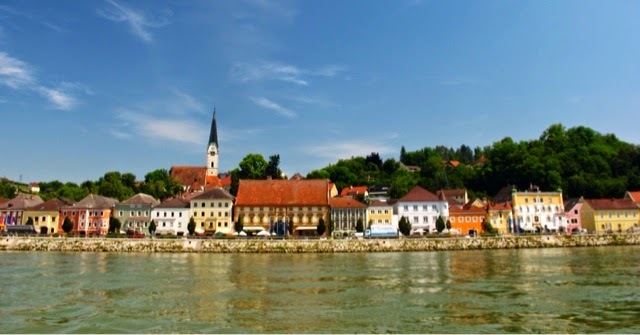 I relaxed, the Stoker was going to be ok.
year's Danube flood at Melk. Backside Status: (10 is bliss) Mike the Captain 6, Judy the Stoker 6.
than 16,000 km after we set out. Judy the Stoker as we pass under high voltage power lines: "Now I'm infertile and tonight I'll glow in the dark". And also from the Stoker: "'86 ks in the Saddle', a book by Major Bummsaw." This canoe and its crew is one of two making an 800 km trip down the Danube from Passau, Germany, to Budapest, Hungary. Radji (foreground) and Fernanda from Brazil. Making their way by bike to Vienna. 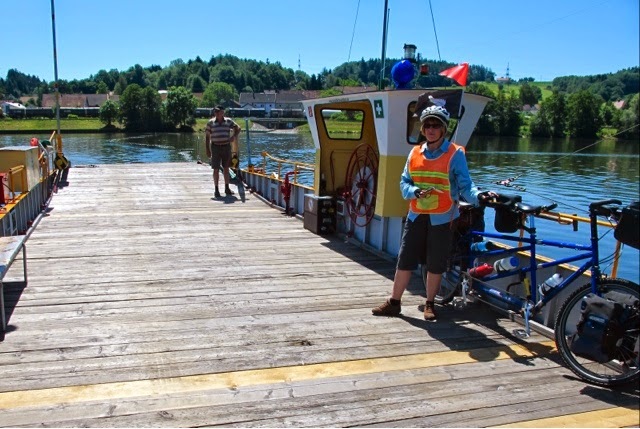 We met them on a ferry crossing the Danube at Grein. Judy unpacks tea bags from their individual paper packets to reduce the space they take up. This way we can store them in the kettle. 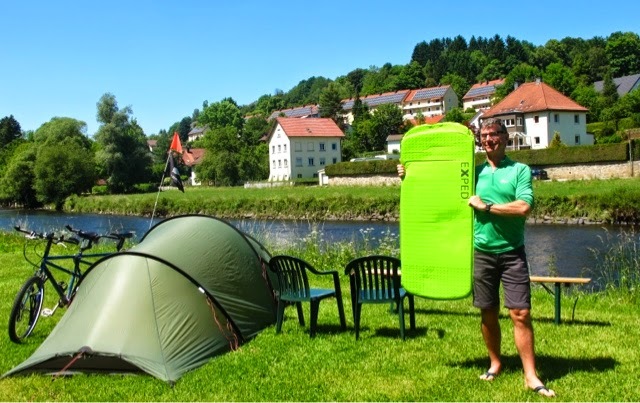 Mike with Exped air mat. When size is everything this packs up small. Laughter spilled from the tent. "I feel like I'm crushing a small child. I want to apologise to it". I peered inside and there was Judy the Stoker rolling up my new air mattress. This is version three and at last I've found one that meets our criteria. First of all it packs up small - much smaller than even a small child - and on a bike, size matters. 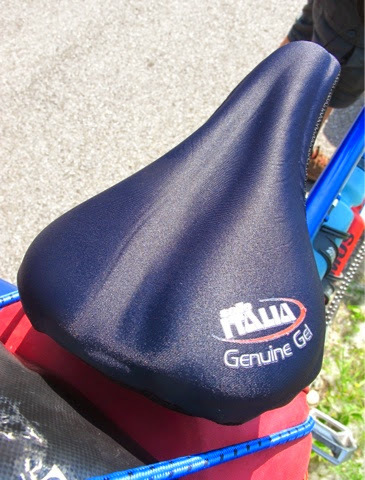 It's also comfortable, and quick to inflate and deflate. The mattress is just one of several changes we've made to improve our equipment for this trip east along the Danube to the Black Sea and hopefully beyond. A new iPad Mini is lighter and smaller than its predecessor, a Kindle has gone and we have shed some clothes. Somehow our front panniers are half empty so when we stock up on food each afternoon we have somewhere to put it. It may be our imaginations playing tricks, but the tandem feels lighter too. 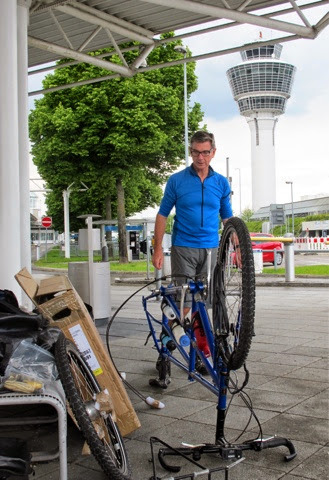 We arrived at Munich airport on a cool, cloudy afternoon and found a quiet spot outside the terminal (to the right as you exit), under cover and with a couple of steel benches - perfect for assembling the bike. By the time we had done that, plus changed money, drank coffee and climbed into our cycling clothes, three hours had vanished. Judy with Jasper, our Airbnb host at Erding, near Munich. But the GPS worked and led us the 15 km to our Airbnb accommodation in the town of Erding. 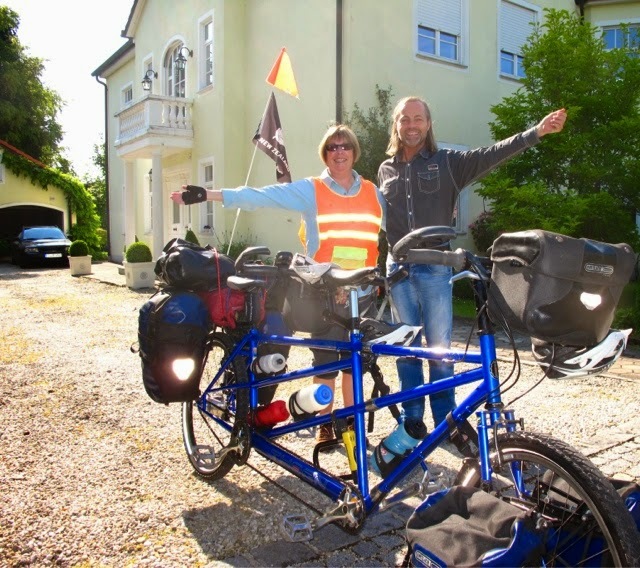 We spent a couple of nights there, just enough time to explore Munich before we headed off to join the Isarradweg, the cycle path alongside the Isar River which runs north to join the Danube. It was perfect cycling - a path mostly for bicycles and pedestrians, lots of "nature" as the Germans say to us, and plenty of places to buy food, even if we did have to leave the cycle path for a couple of kilometres. We have slipped back into touring mode as though we never left it. Once again we are governed by life's essentials - food, water and somewhere to sleep. For those contemplating the route, there are campgrounds near Eching (Kurz Welher), at Piflas in Landshut (shown on our map but unsighted by us), at Mamminger-Schwaigen and at Rosshofen near Osterhofen, despite what the Tourist Office people may tell you in Munich. 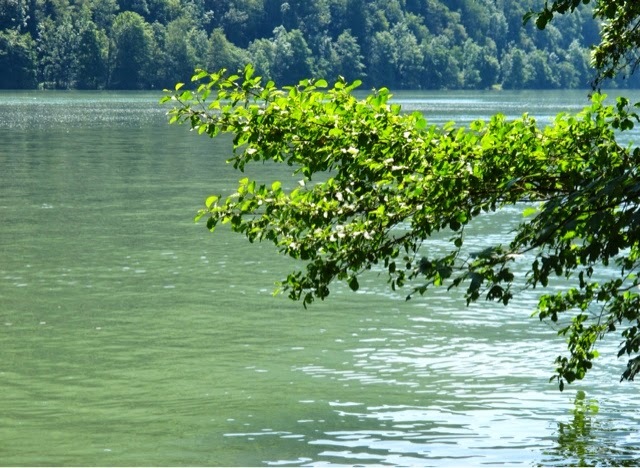 On the fourth day we lost the Isar as it drifted through wetlands and emptied into the Danube. 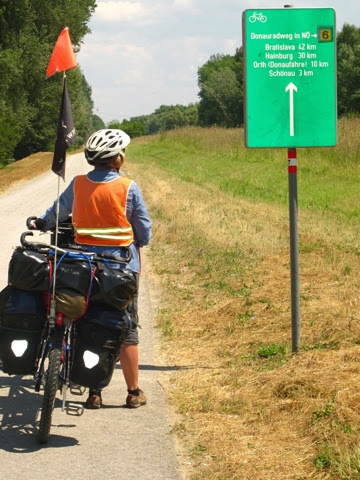 First Eurovelo 6 sign of this trip - we are on our way east. 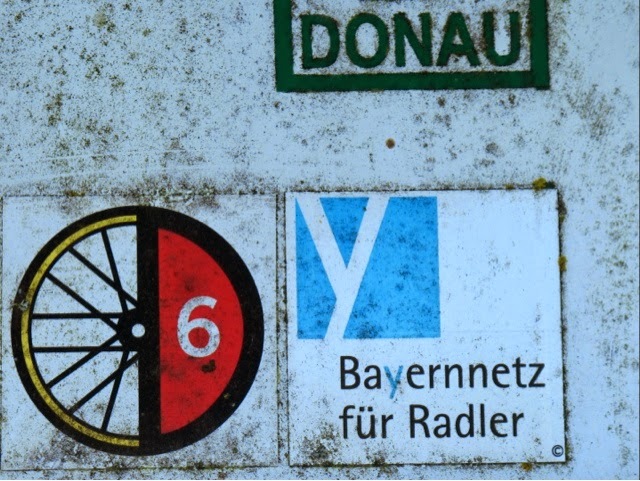 Suddenly we saw our first Euro Velo 6 sign, then the Danube itself and knew we were back in familiar territory, having been this way two years ago. 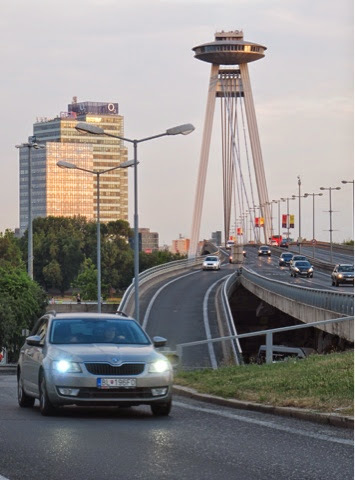 Hopefully these EV6 signs will help guide us for the next 2000+ kilometres to Constanta and the Black Sea. 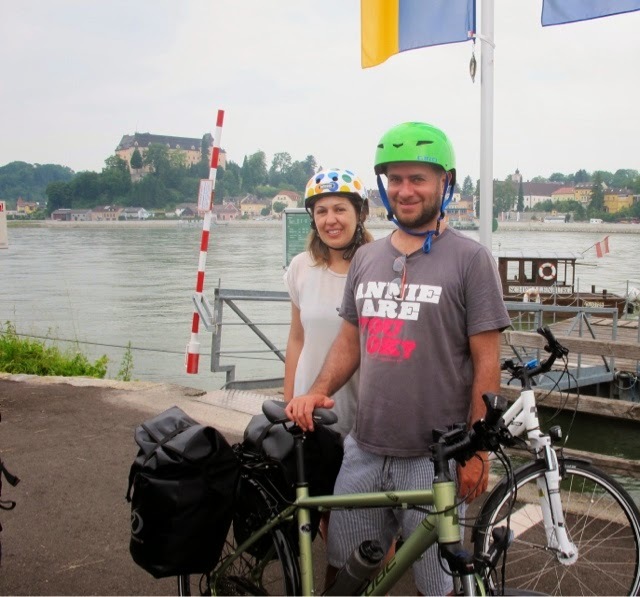 With the Danube came cyclists - dozens of them. 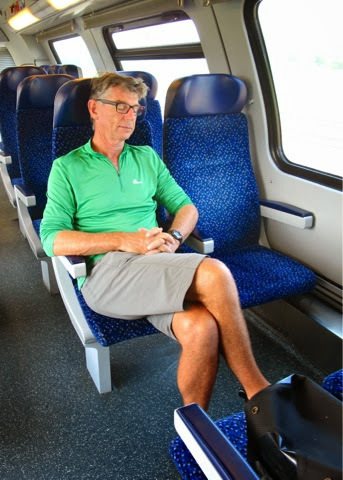 The next stretch from Passau in Germany to Vienna in Austria is the most popular section of the ride. she is carrying several cuddly animals to give to children in Romania. 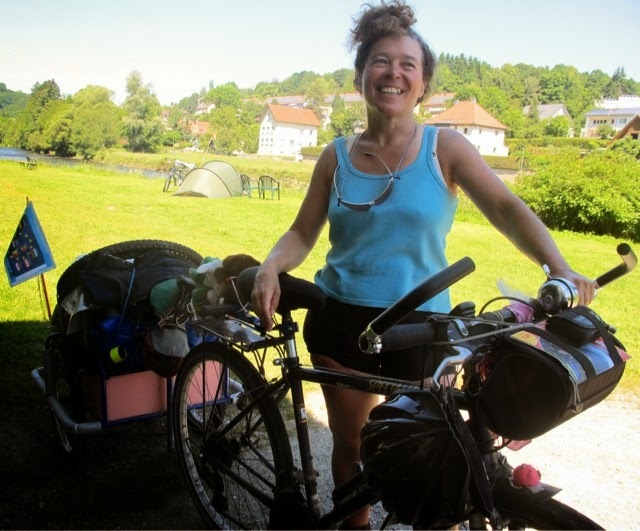 We've already chatted at length to an Aussie/Kiwi couple (Chris and Margaret from Oamaru) and to a solo Frenchwoman (Maud) who has been collecting snails off the bike path and dousing them in water for five days to cleanse them before cooking them with garlic, butter and herbs. She's towing a trailer called Froggie, and like us is bound for the Black Sea. Maud spent a year in New Zealand and summed it up this way - beautiful, a good place to retire to and have a garden. As for us men - we are "gumboot men", which I took to mean lacking in sophistication. Fellow cyclists in the campground at Passau. 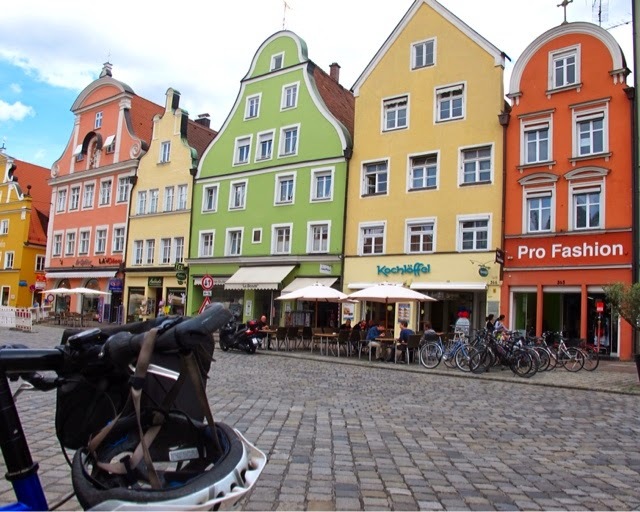 If the cycling sounds fun and idyllic it is - Germany must be one of the easiest countries in the world to tour by bike. But this is just the start. The weather will get hotter and we expect the EV6 will deteriorate the further east we go. After that, who knows what will lie ahead. Backsides: Mike 6 (when 10 is bliss), Judy 1 and going in search of a gel cover for her saddle. "My bum's got bother. My 18 month golden run appears to be over."